Annual to biennial herb, 0.20-0.50m high; possibly of Mediterranean origin, naturalized in Eurasia, North America; flowers yellow-orange, rays orange, 4-5(-7)cm in diameter. 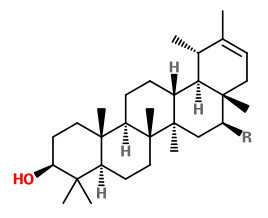 The flowers of C.officinalis are rich in pentacyclic triterpene alcoholes, free and esterified. With a content of about 19%, faradiol-3-O-myristate and -palmitate are the main components of the lipophilic extracts and together with ψ-taraxasterol responsible for the anti-inflammatory effect.